‘Sustainable earth’ embodies ARVIND LIMITED (TELECOM DIVISION)/SYNTEL TELECOM LIMITED’s outlook towards the solution for society business, through which we aim to solve the issues facing society by maximizing the benefits of information and communication technology.ARVIND LIMITED (TELECOM DIVISION)/SYNTEL TELECOM LIMITED Considers environmental management activities to the utmost and contribute to the prevention and solution of various environmental problems. We analyze mass balance in the company’s business operations and use it to develop measures to reduce its impact on the environment. ARVIND LIMITED (TELECOM DIVISION)/SYNTEL TELECOM LIMITED applies the effort in the provision of ‘’solution for society’’, to create a safe, secure, efficient and fair society where people lead the prosperous lives. The continuous improvements in our products & solutions establish a sustainable lifestyle base by utilizing limited resources effectively and taking measures to prevent damage to the global environment in order to live in harmony with the earth. ARVIND LIMITED (TELECOM DIVISION)/SYNTEL TELECOM LIMITED provides support in elucidating casual factors and in formulating countermeasures for various environmental problems in order to realize a sustainable society in harmonious coexistence with the earth. ARVIND LIMITED (TELECOM DIVISION)/SYNTEL TELECOM LIMITED complies with the E-Waste (Management) Rules, 2016 and E-Waste (Management) Amendment Rules, 2017. As part of Extended Producers’ Responsibility, ARVIND LIMITED (TELECOM DIVISION)/SYNTEL TELECOM LIMITED has set up a collection mechanism to channelize and dispose e-waste. ARVIND LIMITED (TELECOM DIVISION)/SYNTEL TELECOM LIMITED has partnered with Hi-Tech Recycling India Pvt Ltd, Recycler registered with Maharashtra State Pollution Control Board for the environmentally safe and sound management recycling for all of our e-waste. It is part of the agreement that Hi-Tech, Recycler collects e-waste from the collection centers and carry them to their plant in environmentally safe and sound manner in order to recycle/dismantle the same. Hi-Tech, Recycler have all the authorization related to e-waste dismantling and recycling from MPCB/CPCB and having all connects related to air/water/hazardous waste. Their Authorized Capacity – 1000 MTA for E-waste and 650 MTA for Cables. Also we have partnered with Logistics Company Spoton Logistic Pvt. Ltd.for door to door collection of e-waste. 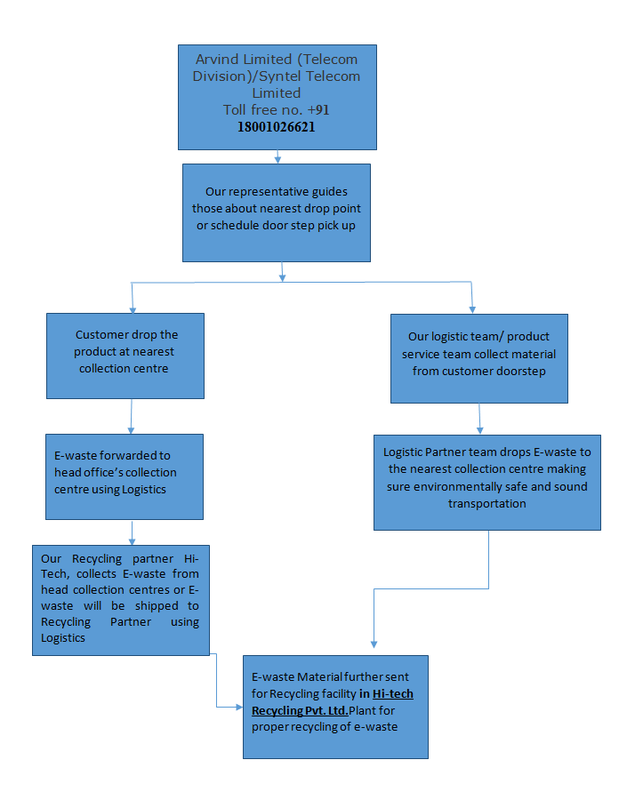 As per the agreement, environmentally safe, sound transportation and handling of all our e-waste collected from door to door service will be done by Logistics partner. As per the agreement with Spoton Logistic Pvt. Ltd., if any customer wants to handover their old product they can reach out to us on our Toll free no. +91 18001026621 and register themselves. Once registered, request for the pick-up will transfer to our Logistics Partner. During the collection of the e-waste, Customer will be provided with the receipt with the product description that can be used to gain the benefits of our e-waste policies/ Schemes. Electronic components contain plethora of toxic materials in varying degrees that contribute directly to a disrupted ecosystem. The dangerous traces of methyl, cadmium, arsenic, mercury, Lead, Barium and Polybrominated Flame Retardants then seep into the soil, polluting the groundwater. If thrown in an inferno, the burnt cadmium along with other toxic substances can very well pollute the air. Many of the chemical compounds present in the electronics are cancerous in nature. While burning the components is a major part of it, the polluted air isn’t just caused by them. In fact, just throwing them into the trash can lead to the poor air quality. Improper disposal of waste will also cause harm to animals & marine ecosystem since they rely on the environment to survive. High levels of certain minerals and metals can also stunt or kill plants, disturbing the local ecosphere dramatically. Improper disposal of harmful wastes also directly affects the economy. It costs states more to deal with side effects such as health crisis, environmental programs and the lack of employment muscle due to death. This generally cripples members of the state that would be otherwise very productive. It is important that measures are taken to deal with harmful waste. The bottom line is that bad waste management practices can result in land and air pollution and can cause respiratory problems and other adverse health effects. 1.Always look for the information on the catalogue with your product for end of life equipment handling. 4.If unwanted electronic equipment still work or can be repaired then consider donating them. 1.Do not dispose the product in garbage bins along with municipal waste that ultimately reaches to landfill. 4.The product should not be opened by user himself/herself, but only by authorized service personnel. Survey no 33/1 Kondhwa Pisoli Road, Pisoli Pune-411060. 303-304, Shaan Complex, Near Sakar –II, Ashram Road, Ellisebridge, Ahmedbad–380006. 122A, Southern Avenue, 6th floor, Kolkata-700029. 2150, Third Floor, 17th Main, HAL 2nd Stage, Indiranagar, Bangalore-560008. 302,3rd Floor, Plot No 31/A, Landmark Building, Old Vasavi Nagar,Above: Andhra Bank, Kharkhana, Secunderbad-Telangana-500015. Navins Presedium, 103.A.Nelson Manickam Road, Chennai-600029.